The Phoenicians and Greeks carried out commercial activities along its 8 kilometres of coastline, but the it was Romans who founded an important factory-town at the mouth of the River Argentino, meaning “silver river” (on a site now known as Punta de Torrox or Faro de Torrox), which was dependent on the larger Caviclum -present-day Torrox-, a prosperous Roman city founded in the 1st century which underwent continuous growth, reaching its peak in the 4th and 5th centuries before being occupied by the Visigoths and, in the 8th century, the Arabs. In 755 Prince Omeya Abd-el-Rhaman settled in Torrox, leading his followers from here to Cordoba, where he founded the independent Emirate. 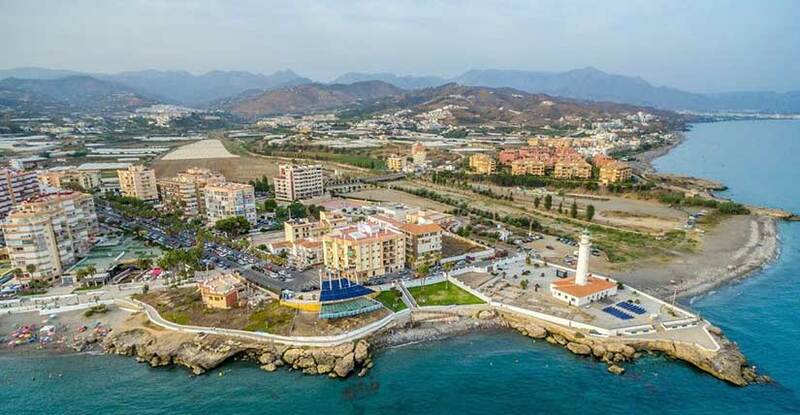 During the Andalusi-Arabic period, Torrox was known throughout the Mediterranean for the production and sale of silk fabrics, sugar cane plantations, oil, almonds and figs. At the time of the conquest by the Catholic Monarchs in 1487, Torrox consisted of three neighbouring hamlets -Alhaguer, Almedina and Alhandac- protected by Torrox Castle which, in time, would lend its name to the town. The definitive capture of Torrox by the Christians did not come until 1488, after a brief spell during which the Moslem leader El-Zagal took control of the town and its castle. Henceforth, the area’s population fell as its morisco (Moslem converts to Christianity) inhabitants fled in the face of the difficult living conditions imposed by their new governors. The situation of those who stayed behind worsened daily, until open rebellion broke out; the moriscos established a stronghold at Peñon de Frigiliana Castle, where they successfully resisted the first attacks by forces sent by the governor of Velez-Malaga Arevalo de Zuarzo; in fact, the uprising was not subdued until reinforcements sent by sea under Don Luis de Requesens, High Commander of Castile, landed on the beaches of Torrox and laid siege to Frigiliana Castle, causing over 2,400 rebel deaths. The High Commander of Castile ordered the destruction of the castle, which was reduced to ashes. In 1570, the process of expelling the moriscos was completed; the land confiscated from them was redistributed among Old Christian settlers. Another important episode in the town’s history occurred during the War of Independence (1810-12), when, on withdrawing from Torrox, Napoleon’s troops blew up the castle, which was left in ruins. The town and its municipal area were shaken by the major tremor known as the Andalusian Earthquake on Christmas Day 1884; extensive material damage was suffered. On 20 January 1885, a concerned King Alfonso XIII visited the area, staying in the building which today houses Torrox’s Cultural Centre. Sugar cane exploitation ushered in prosperous times in the 19th century, and a number of the town’s most noteworthy houses and buildings date back to this era, such as the sugar factory, built in 1890.